Microplanning is a comprehensive action planning procedure for producing development plans for upgrading settlements. Originally designed for use in developing countries, it is based on regular intensive workshops which involve a minimum of preparation, materials and training. The microplanning procedure involves 8 to 12 community representatives working closely with a small team of experts and facilitators for several days. A sequence of activities (see second tab) is worked through to arrive at a development plan and work programme. The process is structured by charts on large sheets of paper which are completed and kept as a record. The workshops are repeated every year or so to monitor progress and plan the next stages. 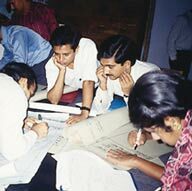 Participants complete charts on large sheets of paper which are then displayed on the walls. Facilitators must have the confidence of all participants and should participate in a workshop to understand its dynamics before running one themselves. Hold workshops in the community rather than in government offices to make local people feel more in control. Do not treat the chart format as a straitjacket. If the one you planned does not seem to work, revise it as you go along. Costs are minimal apart from organisers' and participants' time. Cross-section of local population. 8 ­ 12 people. Provides training materials. Government officer. Responsible for implementing results. Local government officer. Technical experts (eg health, engineering, social development). As many as appropriate. Directs procedure. Practitioner or academic. Conduct small workshop groups (usually 3 needed). Selected from participants.